Just a few weeks ago, Contura Energy was crediting President Trump for creating a brighter future in the coal industry. Now, the coal miner has ditched its plan to go public due to "market conditions." Contura Energy, which was expected to go public on the New York Stock Exchange on Thursday, said it feared the deal would "undervalue" the company. The retreat marks a setback for Contura, which is a revamped version of Alpha Natural Resources. Contura acquired the core assets of Alpha when the miner filed for bankruptcy two years ago amid the collapse of the coal industry. 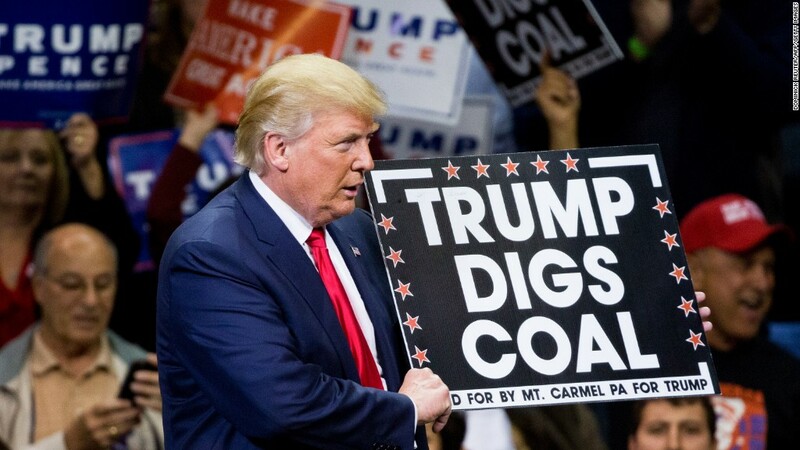 Contura's IPO filing mentioned "Trump" 13 times, mostly highlighting his administration's efforts to revive the coal industry by slashing Obama-era environmental regulations. But Contura said in a brief statement its principal selling shareholders agreed it would be unwise to proceed with the IPO "under current market conditions." It declined to comment beyond the statement it released. That reasoning is somewhat surprising because Contura coal prices are very high right now despite all the challenges the industry faces. "It's disconcerting, to say the least," said Andrew Cosgrove, senior metals and mining analyst at Bloomberg Intelligence. "If you can't get a deal done now, then when can you?" Contura makes most of its money from metallurgical coal, which is used to make steel. "Met" coal prices spiked to a record earlier this year after a cyclone knocked production offline in Australia, one of the world's largest coal exporters. Today, met coal is trading for around $200 per ton, which is high historically. Contura also produces thermal coal, the type that's used in power plants. Thermal coal has come under enormous pressure from cheap natural gas. Still, thermal coal prices are above $90 per ton, which is also high for recent history. Kevin Crutchfield, Contura's CEO, said in the statement that the company will weigh "all strategic options and opportunities to maximize the potential of our young company." It's not clear if Contura's IPO was impacted by market volatility on Wall Street this week. The Dow dropped 205 points on Thursday, the index's worst day in nearly three months.